Putting Green Damage: Can You Fix It without any Penalty? on the surface of the green. The Rules of Golf are very specific when it comes to touching the green surface. It is important to know the extent of your rights. A poor putting surface can interfere with the true roll of your ball. There are many causes for imperfections on the green, and you have a duty of care to other competitors to make good any damage you may have caused. It can be annoying to arrive at the green and find that there is an indentation in front of your ball where someone in an earlier group has carelessly dropped the flagstick. Rule 16-1c allows you to repair an old hole plug or damage to the putting green caused by the impact of a ball, whether or not your ball lies on the putting green. It goes on to say that any other damage to the putting green must not be repaired if it might assist you (or players in your group) in your subsequent play of the hole. This covers not just your line of putt, but anywhere in the vicinity of the hole. 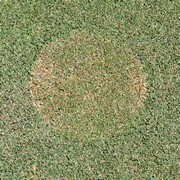 The most visible signs of putting green damage are spike marks, scuff marks where players have dragged their feet, and pitch marks. 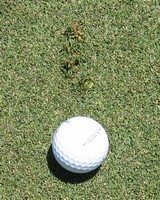 Spike marks on the green are rarer these days as most golf courses have banned metal spikes to eliminate this problem. However, for tour players who are still allowed to wear them for better traction, they remain a bone of contention as tamping down any grass tufts incurs a two stroke penalty in stroke play (or loss of hole in match play). 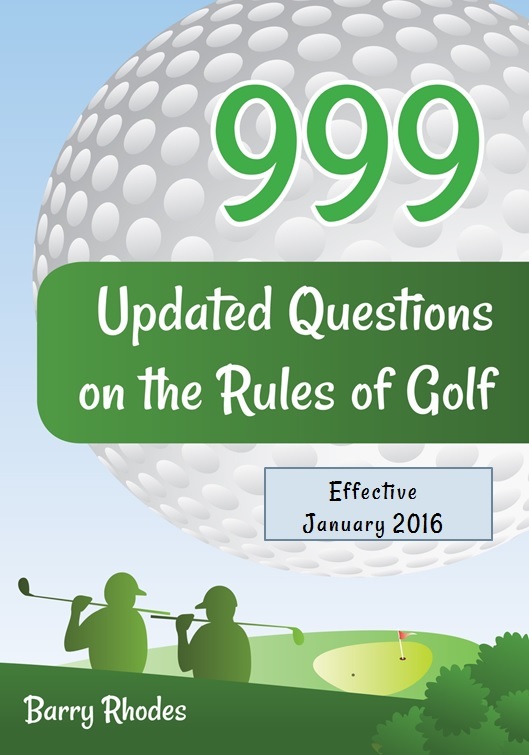 Rule 16-1c appears quite straight forward, but there are some situations that you should be aware of. For example, what happens if someone in your group steps on your line and scuffs up the turf. Can you repair the damage? The answer is Yes as you are entitled to the lie and line of play you had when your ball came to rest. You also need to be careful when fixing any damage other than an old hole plug or a pitch mark. For example, if you fix a spike mark that improves another player's line of putt in your group, you will be penalised. (Decision 13-2/36). It does not matter that you were just trying to be helpful. The correct and safest procedure, therefore, is to wait until everyone has putted out. When it comes to accepting putting green damage that you can't immediately repair, and that could affect your putt, think of the words of Bobby Jones.